Aptamil Profutura Follow On milk, nutritionally tailored for babies from 6-12 months. DHA (Omega 3 LCP) to support normal visual development of infants up to 12 months. The beneficial effect is obtained with a daily intake of 100mg of DHA. *33% more DHA than in all Aptamil Follow On milks. Aptamil Profutura Growing Up milk is nutritionally tailored for toddlers 1-2 years to support their growth and development. Inspired by discoveries in Early Life Science and 40 years of breastmilk research, our passionate team of scientists have developed Aptamil Profutura Follow On Milk, our innovative formulation with phospholipids. It contains specific nutrients tailored to complement a baby's varied and balanced weaning diet. Store powder in a cool dry place., Do not refrigerate., Use powder within 4 weeks of opening. 1 Wash hands and sterilise all utensils according to manufacturer's instructions. Boil 1 litre of fresh water. Leave kettle to cool for 30 minutes and no longer. Measure the required amount of water (refer to feeding guide) into a sterilised beaker. Be careful of scalding. Do not use artificially softened or repeatedly boiled water. 3 Add the correct measure of powder to the water. Adding too many or too few scoops can be harmful. Mix well (for 10 seconds) to dissolve the powder. Replace lid on beaker. After 6 months, once weaning is established, your baby will need about 1 pint (500-600ml) per day. Aptamil Profutura Follow On milk is tailored to help meet the nutritional needs of infants from 6 to 12 months. This information is given as a guide only. Consult your healthcare professional if you require more advice. Never add extra scoops or anything else to your baby's feed. Never leave your baby alone during feeding. Important notice Aptamil Profutura Follow On milk is only for babies over 6 months, as part of a mixed diet. It should not be used as a breastmilk substitute before 6 months, so if you wish to use this product before 6 months, we advise that you consult your healthcare professional. 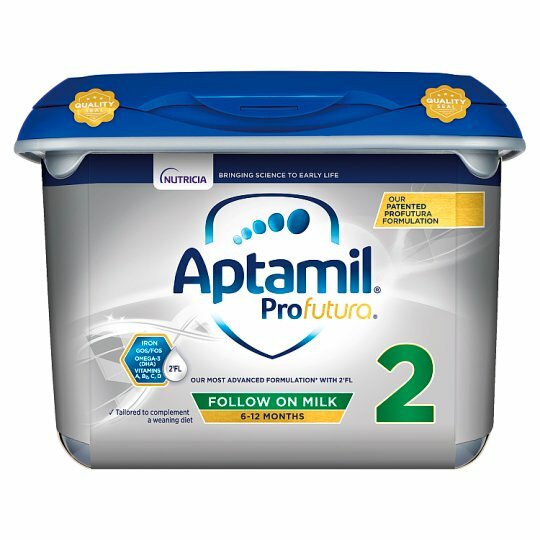 Aptamil Profutura Follow On milk should be used on the advice of a doctor, midwife, health visitor, public health nurse, dietitian, pharmacist, or other professional responsible for maternal and child care, based on baby's individual needs. Do not allow prolonged or frequent contact of milk feeds with your baby's teeth as this increases the risk of tooth decay. Ask your health professional or dentist for advice. Make sure your baby's teeth are cleaned after the last feed at night.